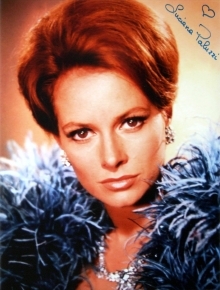 Luciana Paluzzi became an actress by accident when a friend of her father's came to dinner. The man knew that film director Jean Negulesco could not find an actress for a small part in Three Coins in the Fountain (1954) which was filmed in Rome. Luciana was sent to Negulesco and she soon found herself employed. "I went on set and thought that this is what I want to do for the rest of my life." She went on to appear in many movies, some made in her native Italy, and occasionally being credited as Luciana Paoluzzi. Her early films included the WW2 adventure Tank Force (1958) with Victor Mature & Anthony Newley, the comedy Carlton-Browne of the FO (1959) with Terry Thomas & Peter Sellers and Muscle Beach Party (1964) with Frankie Avalon. has also made appearances in several TV series' - Five Fingers (1959), Bonanza (1962), Burke's Law (1964) and The Man From U.N.C.L.E. (1965). 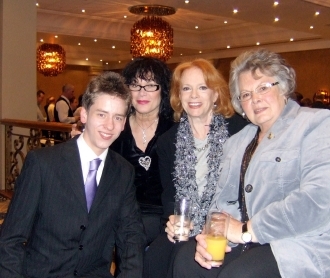 It was really great to meet Bond girl Luciana Paluzzi at Autographica in Birmingham in April 2008. I had a chat to her at the guest reception and had my photo taken with her along with Thunderball girls Martine Beswick and Mollie Peters. 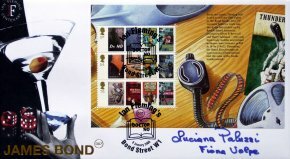 Luciana signed my Thunderball litho, my Bond Girls book, several photographs and a 007 First Day Cover. Best of all, I sat next to her at the Gala Dinner, and talked to her a lot about Bond! I got a big hug and a kiss from her before I left!! Domino...I arrived in London, and there were about a hundred girls, I couldn't believe how many people there were in the make-up room! I did the test for the leading role, and then I went back to Rome. Two months went by and I didn't hear anything from anybody. Then I got a call one day from the Director Terence Young who said, 'I have good news and I have bad news....the bad news is that you can't play the role of Domino, but he good news is that you're going to play the role of Fiona'. The 'bad girl' part was more fun to play." turns her when dancing with her at the Kiss Kiss Club so that she is shot in the back by a bullet meant for 007. Return To Peyton Place (1961). They had a son, Christian, but divorced in 1962. Since 1980, she has been married to Michael Soloman and they live in Los Angeles.